The Ullr team season begins mid-September. The baseline cost of the preseason program (Sept. to Dec.) is 150$. This guarantees a minimum of 6 dryland sessions, and covers staff training, coaching, administrative, and transportation costs. Dryland is optional and involves some events that are usually ‘pay as you go’ (an example of this would be payment for trampoline training facilities). The staple features of dryland are at least 1 water ramp session in Red Deer; a minimum of 5 trampoline sessions per athlete; 1 dive tank session; 2 team hikes (occasionally an overnight); at least 6 gymnastics oriented drylands in Canmore; and, when we have the numbers, a jump camp at Mt. Sima (in Whitehorse) mid-November. 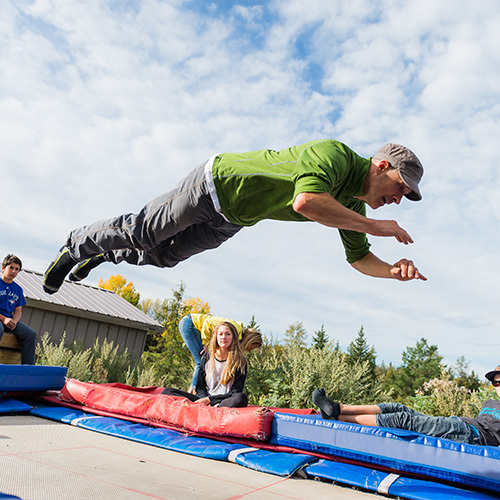 As for other fall events, we sometimes do paintball; a mountain bike ride; parkour in Calgary; Freshtival; and rock climbing with a certified ACMG guide. and we reserve a second day for small group, or private, lessons as needed, or by request. This is a ideal option for athletes that are competing in other sports. 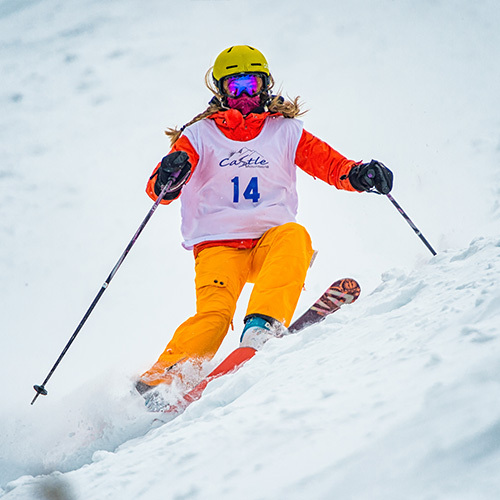 This is good for younger athletes who are interested in improving their skiing, or who are only testing the waters with the junior freeride competition circuit. This program is great for athletes who view freeride as their primary winter sport, or who are hoping to be professional skiers. Additional on-snow ski days run at $55 per day. 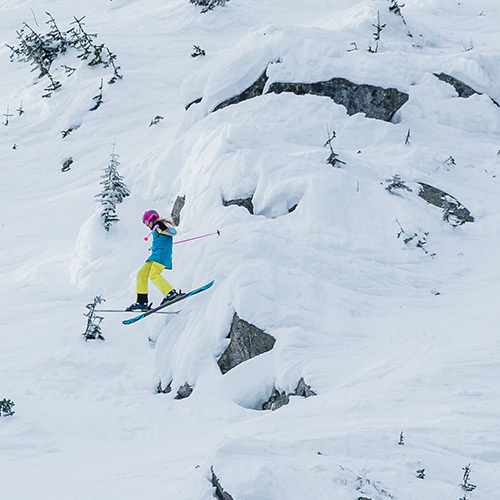 All of our programs offer regular video analysis, to improve the athlete’s skiing, some opt-in sports psychology sessions, and an opt-in backcountry program. (We also try to get our athletes to opt-in to at least one full day using carving skis). Each local training day, conditions permitting, begins at 8:45 a.m. and usually ends at 3:30 p.m. When the skiing is really good, we sometimes stretch the day to 4 p.m. We base the ski groups not on age, but ski level and social compatibility. When skiing at home hills on the weekend, our team ski day is Saturday. However, we do our best to offer a flexible program to our athletes. Due to weather, our athletes involvement in other sports, their desire to ski with school friends or family, and occasionally extenuating circumstances for our coaches, we try to allow a few Sundays each season, as well as holidays, for ‘make-up days’ for athletes. To keep the quality of the program high, we try to keep the ratio between coach and athletes low, and are committed to having a team ceiling of less than 25 athletes. With respect to equipment, helmets are mandatory and we request the athletes have a back protector, mouth guard, rock skis, twin tip all mountain skis (or a powder ski with dimensions close to this), and ski poles that are standard length (about a 90 degree arm bend holding the pole upside down under the basket, and with the athlete in ski boots). There is no official parent volunteer commitment. However, parents can ease logistics, or offset the additional costs of the program, by a willingness to chaperone athletes at away events (which can involve car-pooling other athletes) or by helping with the team hikes and backcountry trips. 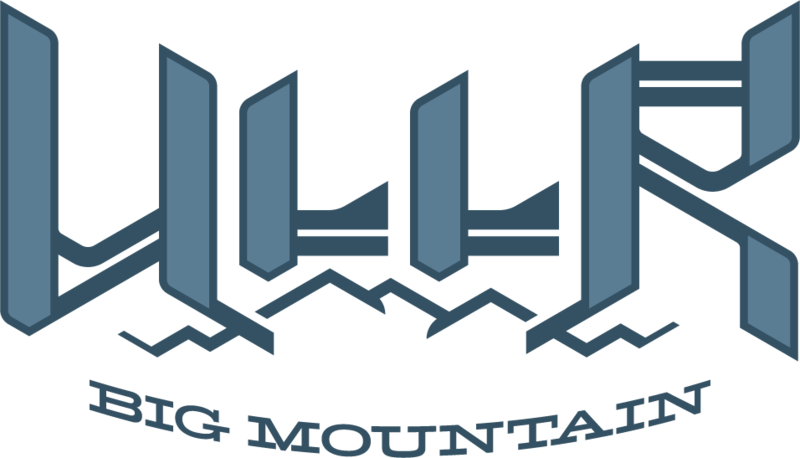 Registration for the Ullr Big Mountain Team can be done by cheque or email transfer. 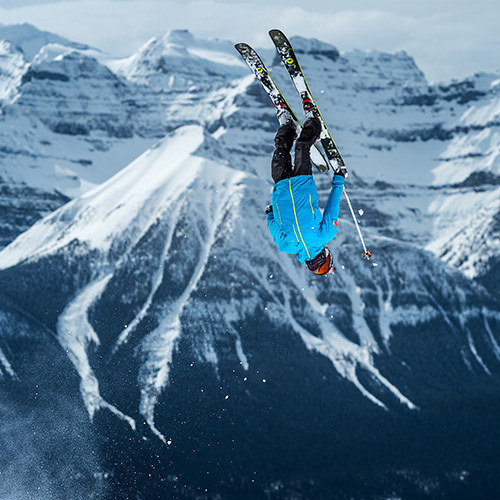 For training purposes, Ullr athletes are required to register with Alberta Freestyle. This allows us to use freestyle training facilities and allows a certified coach to legally coach inverts .